Genentech Sponsors a Week of Grocery Deliveries! Genentech sponsored a week of grocery delivery costs for approximately 220 homebound seniors and adults with disabilities during the week of July 30th through Store to Door’s Support-A-Week program. 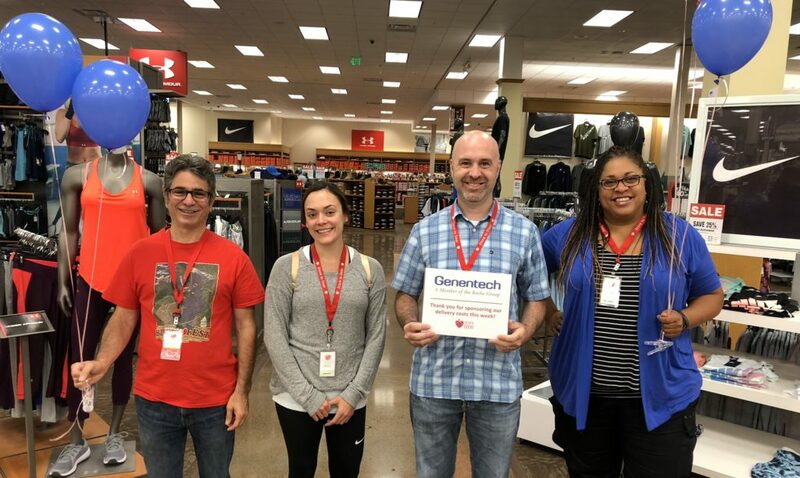 Employees of Genentech celebrated the week by volunteering to grocery shop for Store to Door clients, along with 50-60 other Portland-area volunteers, two times in the month of August. Genentech first sponsored a week of grocery deliveries in 2015, and continued their support through 2016 and 2017. Other companies who have sponsored a day or week of grocery deliveries this year include Dave’s Killer Bread, First Tech Federal Credit Union, and Wells Fargo. Store to Door’s program is made possible by a close partnership with Fred Meyer. We would like to thank Genentech for their continued support, and we are excited to continue working together!